Life has been more hectic than usual. Rushing here and there (in, around, and out of the house). I've started driving again, after months. I took one personal class out of the centre, at a public pool, a VIP client, but got so pissed ended up that was the first and last lesson I had with her. Anyhow, Alhamdulillah for the experience. Every student is different, every client is different. Asalkan mengajar ikhlas that should be enough. Just a side note, I didn't expect her to be like that. I didn't expect such words from her after teaching her wholeheartedly. She have back and neck pain, and also knee problem. See how challenging it is to teach her to swim? And oh, she's already 60 plus years old. Datang lambat to the pool some more. And I actually left Sofia at home just to teach her at a public pool. Sheeshhhh... Ugh and here I am rambling about it here. Not a big problem I guess since I didn't reveal who she is. If I do reveal it, man, you know her. Just a Google away. Ah anyway, the 4R pictures I ordered online finally arrived... And I am disappointed with it! 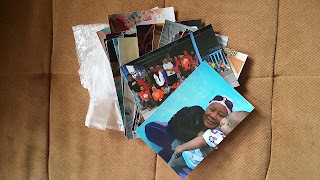 RM40 for 50 pieces of 4R photos, I certainly do not expect that kind of quality. A simple glossy paper nipis. Yes the pictures are all taken from my phone, but honestly, if you print it on a better paper IT WILL turn out nice. So my point is it is not because of my phone camera. It is the paperrr.... Just like when I got them printed at a booth in Mydin Meru, Ipoh. It turned out so good... And that costs me RM1 per piece. Kalau print banyak got cheaper also. The edges are also not smooth, which probably meant they were printed on a large paper and then they simply cut it out. Like so jimat. Urgh. My husband even said he always print gambar kat glossy paper je kalau nak jimat. More urgh. But it was my mistake also... I didn't check the type of paper they used and whether they have a matte finish ke apa. Anyhow, they also did not state the paper quality in their post. Aih I feel cheated. Anyway, it's Friday. Yeah basically semalam I didn't get to finish writing this post. Let's all try to be thankful today. So. Urm. I am thankful I finally got away from the VIP client, or it would be a hassle to arrange pools (can we learn at any otel pools? ; yes the message was typed 'otel') and also thankful I finally got pictures of Sofia printed out (despite the low quality at least ada). And I'm thankful Sofia is sleeping now so I can finally complete this post. HAHAHA. I hv nothing to comment. Even the word otel pun no commen. Iyeke mek. Tq :) Kumpul gambar Sofia banyak-banyak lagi baru print. Thanks for dropping a comment though. adoi mahalnya babe. why dont you go for photobook babe. I think lagi berbaloi. yang I share Pixajoy tu , quality dia okay jugak. or Photobok, yang tu kena rajin cari voucher kat Lazada lah.